photo courtesy of Beaulieu Enterprises Ltd. 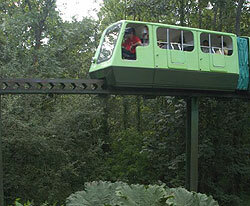 The Beaulieu Monorail is a combination excursion/transport monorail located at the Beaulieu Estate. The system guideway has a loop configuration and includes a South and North terminal. The monorail transports visitors from the National Motor Museum to Palace House. It also travels through the roof of the National Motor Museum, giving travellers a bird's eye view of the collection of over 250 vehicles, before continuing its journey outside. The system was obtained from one of the famous Butlin's Holiday Camps and moved to Beaulieu. The train design was modified from the Butlin's "bullet car" look into a boxier design that allows more space for passengers.